Dave and I aspire to lift spirits and brighten the world through art. We act on our mission by turning metal into graceful forms and finishing them with vibrant colors that add luster to landscapes and levity to moods. 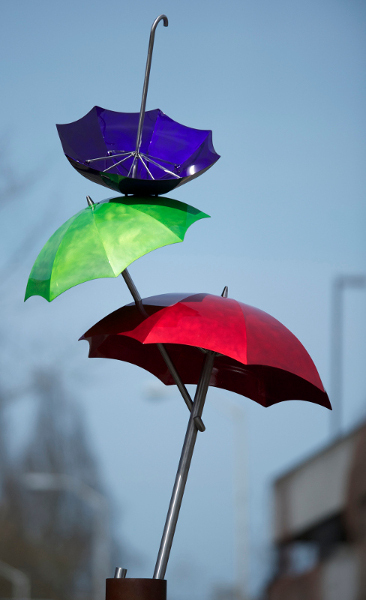 Since 2008 Dave and I have created sculptures for public and private settings. At its simplest I design and Dave builds. I love rich forms, clean lines, and thoughtful use of curves to create grace, motion and sophisticated playfulness. I add dimension in intriguing ways to captivate the viewer from every angle. Dave uses his craftsmanship to bring my concepts to life. He engineers my designs and fabricates them with a high level of workmanship that ensures quality, durability and ease of installation/maintenance. We have created several iconic pieces for Pacific Northwest communities that evoke a sense of a place and have become popular photo opportunities and distinctive landmarks for these cities. We hope you enjoy our gallery of work. If you'd like to inquire about an existing piece or are interested in commissioning a new work, we would love to hear from you.